Our "Virtual Sunday Church" takes us to the Lichfield Cathedral today, to hear the well-known Advent hymn, Lo, He Comes with Clouds Descending. By the power of your blessing enable me, throughout this day, to speak and act to your glory with a pure spirit, with humility, patience, love, gentleness, peace, courage and wisdom. Let me be always aware of your presence. By the power of your love, grant me to hold fast to that which is good. Preserve me from every word or deed that corrupts the soul; from every impulse unpleasing in your sight and hurtful to my fellow man, my brothers and sister. O God, the creator and preserver of all mankind, I humbly pray to you for all sorts and conditions of humanity; that it might please you to make your Word known to them and bring your saving health to all nations. In particular I pray for the entirety of your church, in all of its many forms; that it may be guided and governed by your Holy Spirit, and that all who profess your name and call themselves Christians may	be led into the way of truth. May all of us live in the unity of spirit our faith in Christ provides to us, in the bond of peace, and in righteousness of life. "When your time comes to be with your fathers, I will raise up after you your descendant, who is one of your own sons, and I will establish his kingdom. He will build a house for Me, and I will establish his throne forever. I will be a father to him, and he will be a son to Me. I will not take away My faithful love from him as I took it from the one who was before you. I will appoint him over My house and My kingdom forever, and his throne will be established forever." But the angel said to him, "Do not be afraid, Zechariah, for your prayer has been heard, and your wife Elizabeth will bear you a son, and you shall call his name John. And you will have joy and gladness, and many will rejoice at his birth, for he will be great before the Lord. And he must not drink wine or strong drink, and he will be filled with the Holy Spirit, even from his mother's womb. Today, with nine days left until Christmas, we start our Christmas readings in earnest. The birth of Christ is bound up with the birth of John the Baptist. God did not send Christ into the world cold, as they say in the theater (and in sales). John the Baptist was His warm-up act and His emcee; he introduced Christ to Israel by prophesying His imminent arrival and then by baptizing Him in the Jordan River. Their ties began before their birth. Zechariah and his wife Elizabeth were Levites, the descendants of Aaron, the tribe from which Judaism took its priests. 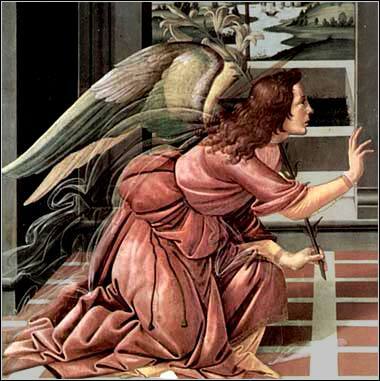 As would happen to Mary in six months, John's father was visited by an angel (Gabriel) to inform him of a miraculous birth. In John's case his birth was remarkable because of the age of his parents. As happens several times in the Old Testament (most notably Sarah), God chooses a barren woman, past the age of conception, to bear a child of a special significance. Thus, people will find it easier to accept the child as special, since his conception was a miracle. His mere existence is a sign of his significance. John the Baptist reminds us somewhat of Samson. Both were born to barren women; both were announced by an angel; and in both cases, the angel forbade them to drink alcohol. (See Judges 13.) Samson's strictures were more stringent than John's, because he was a Nazarite, and was forbidden to cut his hair or beard. John, however, although not a member of a formal monastic sect, would prove to lead a monastic life: living in the wilderness in rough clothing and surviving on locusts, as a sign of his dedication to God. Note that the name "Zechariah" can cause some confusion. It is a good transliteration of the ancient Hebrew, but various versions of the Bible Latinize the name to Zacharias or even Zachary. However, there is a more important Hebrew prophet also named Zechariah. This person lived 500 years earlier, and his prophesies are contained in the Book of Zechariah, the penultimate book of the Christian Old Testament.